As spring hopes eternal so, too, do the annual Spring Training stories. Guys are in the best shape of their lives or feeling better than they have in years. Or futzing with new pitches. In fact, so many guys try new pitches that Jason Colette keeps an annual, running list of pitchers who are attempting to add to their arsenal. Edwin Diaz is among those attempting to do that this year by adding a changeup to his very fast fastball and exceptionally mean slider. Mariners General Manager Jerry DiPoto says that so far the changeup is “pretty firm.” He also adds that “it could be something in [Diaz’s] back pocket that he can introduce against an occasional lefty.” But does he even need it? 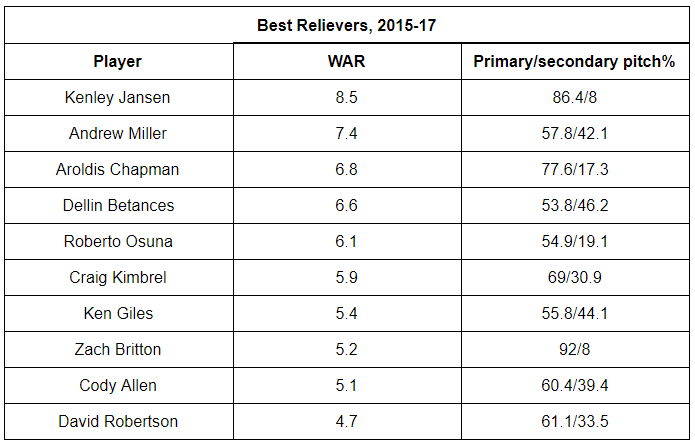 A glance at the top 10 relievers over the last three years tells us a few things. None of them threw any two pitches at a volume that would allow them to throw a third at a clip of 10% or more. Jansen’s and Britton’s numbers don’t even facilitate doing it for a second pitch! That 10% seems to be the tipping point at which an offering is actually useful to a pitcher. That’s when a hitter has to be accountable to it, or at least be aware of it in the back of his head. Less than that and they can take their chances focusing on what they know is coming more than 90% of the time. The lone near-exception in this group is Roberto Osuna. After his fastball and slider, he’s thrown a cutter 9.4% of the time. He’s thrown a changeup slightly less than that (8.4) and a sinker slightly less than his change (7.4). While his repertoire might be an outlier compared to his peers, he still falls short of the 10%-per-offering threshold. It’s important to acknowledge that each reliever’s primary and secondary pitch types aren’t listed above. They all throw different stuff. But what they use, they use similarly. In this sense, it’s kind of like taking different routes to the same destination, but each one takes the nearly same amount of time. Looking at each reliever’s individual splits shows us that almost all of them also faced a relatively even amount of right-handed and left-handed hitters. Only Miller, Chapman, and Britton had splits that tilted more distinctly one way, and that was against righties. None faced notably more lefties. And that brings us back to Diaz. He, too, has faced more righties than lefties so far in his time in the bigs, about 14% more. Adding a pitch specifically to focus on hitters he’s seen less of, in anticipation that he might see them more, seems premature at best. Remember, the M’s moved Diaz to the bullpen because he couldn’t develop a third pitch to stick in the rotation. That’s how we get a lot of our power relief arms. As a starter, that third pitch is way more critical because of the volume of hitters per appearance. For relievers — especially the dominant ones, which Diaz is capable of being — the lack of volume is by design. Odds are that Diaz stops fiddling with a changeup and just keeps throwing his fastball and slider as the season gets going. But nonetheless, the situation feels like trying to push a buoy underwater. It’ll just keep bobbing back up. And why the Mariners would advocate for it in this context, whether passively or actively, is very, very confusing to me. In my day job, I’m an educator. For every lesson planned, there’s a constant inner monologue, a series of cascading questions. What’s the best way to approach the day’s goal? Does this lesson serve the unit? If not, does the lesson have enough value to still include or would it just be empty fun? What questions can I anticipate, and what answers could I have ready? If I were the Mariners, I wouldn’t plan for Diaz to throw a changeup. If he asked to do it, I’d conference with him about why he thinks it would be effective. I’d speak to him, with evidence, about why it might be cool, but emphasize that it’s definitely not necessary to succeed. I’d map out why it makes sense for him to just throw that dang slider. But alas, I’m not the M’s. We hoped you liked reading Power Relievers and a Third Pitch? by Tim Jackson! Interesting piece. Could this scale to starters who throw 3 versus 4 or 4 versus 5 pitches? Thanks! I think it could? There are definitely guys who throw too many pitches who could serve to simplify their games. I wrote about Vince Velasquez being one of those guys last year. Probably less common than guys who need a third pitch, but at some point I guess they’re all in the same boat. It’s a really interesting consideration. I could look at it in the future. Many relievers occasionally throw a third pitch but usually it is a crappy pitch that is more a different look kind of pitch and not an effective one.